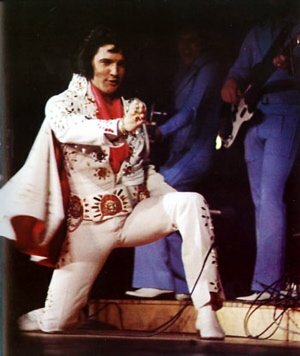 Other than Memphis, then, what city hosted Elvis on stage the most times spread out over his entire career? 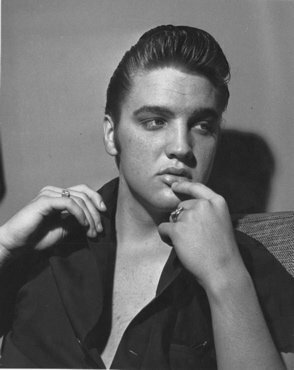 It turns out to be Detroit, where Presley appeared on stage seven times from 1956 through 1977. The city’s residents never saw Elvis during his formative years of 1954-55, since he hardly ever performed outside the South then. 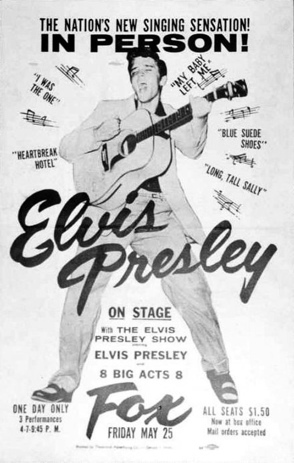 However, they did see his show in May 1956, when his career was just starting to explode. He came back in the spring of 1957, when he was the biggest name in show business. Then, in 1970, when Elvis returned to live performing, Detroit was one of his first stops when he took his act back on the road. 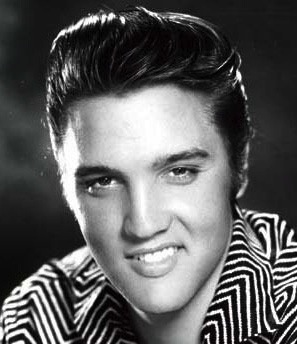 Presley returned to Detroit in 1972, 1974, and finally 1977, just four months before his death. Surveying how the Detroit press reviewed Elvis’s seven shows there through the years provides an overview of his stage career from beginning to end and with both its ups and its downs. Still a month away from his bombshell appearance on The Milton Berle Show, Elvis gave three shows to a combined audience of about 12,500 at Detroit’s Fox Theater in his first appearance in the city. “Sporting a green jacket, tight pants and guitar, Elvis loped onto the stage,” observed an unidentified reviewer in the Detroit News. “The guitar seldom got twanged, because Elvis was too busy flexing his knees and swinging his thighs like a soubrette in the palmy days of burlesque. With each manipulation, local adherents of the Presley cult cut loose with screams.” Elvis’s estimated pay for his three 30-minute shows was $10,000. By the time he returned to Detroit 10 months later, Elvis was a movie star, having just finished work on his second film, Loving You. Detroit was one of only 18 cities Presley played that year, as he concentrated on his Hollywood career. This time he did two shows of 40 minutes each in the city’s largest arena. “It was like a Saturday matinee at the movies, only a thousand times more shrill, penetrating and hysterical,” noted John Finlayson in his Detroit News review. “His fans shrieked, sobbed, moaned and writhed in their seats, the noise reaching deafening crescendos with each intonation of the palpitating Presley voice.” Finlayson noted reports that Presley was losing his hold on teenagers. “He may be, but it’s not noticeable in Detroit,” he concluded. After two runs in Las Vegas in 1969 and 1970, Elvis went out on a full road tour for the first time in 13 years. Detroit was the fourth stop, so the city got to see Presley again in the full energy of his stage comeback. This time his single 45-minute show in the Olympia drew nearly 17,000 “screaming, jumping and almost hysterical fans,” according to Tom DeLisle’s article in the Detroit Free Press. “Evidently, 1956 wasn’t that long ago … Not bad for a 35-year-old dude,” he added. “Nothing had changed. Not the songs … Not the screams. Not the famous pelvis. Not the left leg. There it was, shaking and moving, ramming back and forth with the music. Making women swoon, fathers worry about their daughters.” One thing had changed, though. Elvis was dressed “all in white, with a baby blue silk scarf tucked under his highneck shirt which plunged open to his stomach.” The era of the jumpsuit had begun. Two years passed and Elvis is back at the Olympia, this time playing to an exact count of 17,105, according to Detroit Free Press reviewer Lawrence DeVine. Elvis is now 39, but little seems to have changed with his stage show. 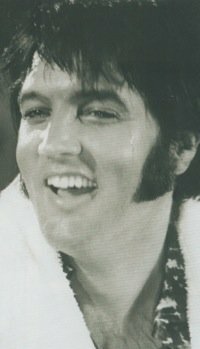 “For time, in its way, stood still as Elvis Presley, the regal rock-and-roller, cannonaded onstage in his third decade of breaking hearts and launching dreamboats,” noted DeVine, who had trouble finding anything different in Presley’s stage demeanor. Instead he concentrated on Elvis’s latest jumpsuit. “[Elvis] showed up on stage in a pure white jump suit with a stand-up collar. On his back was a red-and-green rhinestone-encrusted dragon. A testament to Presley’s innate good taste, the dragon did not light up or stick out is glass tongue.” He could still pack them in, but was Elvis starting to get bored? "Surveying how the Detroit press reviewed Elvis’s seven shows there through the years provides an overview of his stage career from beginning to end and with both its ups and its downs."